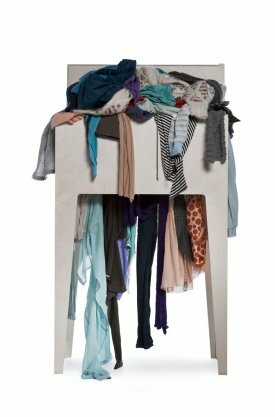 If we assume that our choice of wardrobe every morning follows practical and hygienic considerations rather than taste alone  our clothing arsenal is based on taste anyway, namely our personal taste  then this garment dispenser is well suited to solving this pseudo-problem aleatorily and thus absolutely conflict-free. It independently combines different items of clothing and comes up with new and surprising outfi ts every day. This is mainly due to the construction of this piece of furniture, which is designed like a Kleenex-box. Inclinations in the box bring the top-loaded clothing items into position, and ensure that, depending on the supply from the top, they are at some point drawn out of the dispenser again.